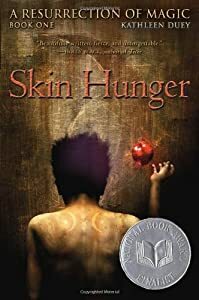 Since Saturday is December 1st I will use today to do a book review for another Book Award contender: Skin Hunger by Kathleen Duey. This is the first of a trilogy called “A Resurrection of Magic.” It is of the Fantasy genre and it is the story of two protagonists. The stories are told in opposing chapters. One of the stories is of Sadina, a young woman whose mother died at her childbirth at the hands of a fake magician. Because of this death, Sadina’s father hates magic and forbids it. As a young girl, Sadima discovers she has the ability to read the thoughts of animals and has to keep this ability a secret for fear her father will find out. One day she comes across a young stranger, a magician, who invites her to go live in the city with him where he and his friend are resurrecting the magical ways. She goes. The second story is that of a young boy and takes place (I believe) centuries later. He is forced to go to a school for magicians where the boys are mistreated to the point that they starve to death if they cannot conjure up food for themselves. As you read the story you begin to realize that the two teens are connected in a very specific way, but the are still questions about the “how” at the end of the book. I’m not sure how I feel about this book. I don’t know if I like it or not. The boy’s story had lots of unnecessary swearing in it. I don’t have a problem with swearing (as you all know) but it just didn’t work. It’s like it was just there and didn’t serve much of a purpose. In Nick and Nora’s infinite playlist, all of the swearing in that book did work for me. So it’s not the swearing the bothers me, it just that it wasn’t used well in this book. I don’t think it was particularly well written. I have read LOTS of better written books this year. I don’t think it was a terrible book. It was certainly entertaining. I will probably read the next two books in the trilogy. But I don’t really understand why it was nominated for the national book award. It wasn’t out of this word spectacular. If you have read it I would be curious to know what you thought of it. Maybe I’m missing something?